Beautifully upgraded and rare 'Regent' model in desirable Greenwood Park. 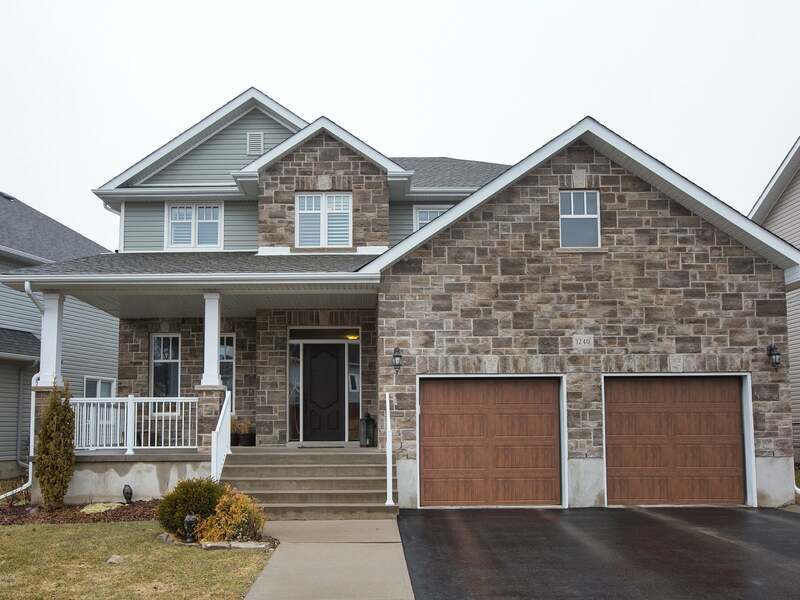 Featuring over 3,500 sq/ft of finished living space, 4 large bedrooms & 3.5 baths! This exceptional home offers large front porch, 9ft main floor ceilings w/maple hardwood & tile, formal living room w/french doors, formal dining room and extensively upgraded maple kitchen w/l-shaped island & 2 sided extended breakfast bar, granite counters, built-in pantry, pots & pans drawers and built-in desk plus patio doors to large maintenance free rear deck w/gazebo. Gorgeous family room w/lots of natural light and gas fireplace with stone surround. Main floor powder room and oversized laundry/mud room with access to double garage. Upstairs offers 4 bedrooms including huge master w/walk-in closet & luxury ensuite w/tile & glass shower plus corner soaker tub. Finished lower level w/rec room, laminate flooring, 3-pce bathroom w/tile shower & den w/window and closet. All this plus C/Air, HRV, pot lighting, beautiful landscaping and more! Exceptionally well located just steps to Butternut Creek walking trail and close to CFB, RMC, Queens, KGH, schools, downtown & brand new Riverview Shopping Centre! This home must been seen to be fully appreciated. Floor Area 2,797 Sq. Ft. Lot Size 73.91 x 105.18 Sq. Ft.